The 2012 editions of the CIK-FIA U18 World Championship and the Academy Trophy are launched officially. This Friday, in Braga, Drivers attended the briefing and then took part in the Edukart educational programme before discovering, or in some cases rediscovering, the Portuguese track. The atmosphere is friendly but the pressure of racing is already there and everyone is preparing as well as they can for Qualifying Practice on Saturday morning. The paddock, with its uniform arrangement of identical team tents, is already setting the tone: the U18 World Championship is different to other championships. 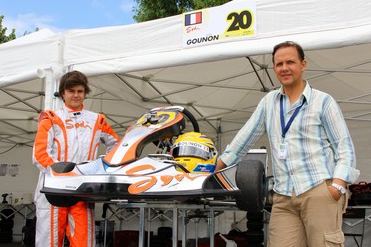 Introduced in 2010, this world competition for under 18 year olds is in its third season this year, but still gives that breath of fresh air to international karting with its original concept: maximum cost reduction, the same chances of success for everyone and education for young Drivers. As is customary in this competition, Friday morning is reserved for the briefing given by the Race Director and the Edukart programme. After receiving the subject for study, Drivers are invited to answer multiple-choice questions relating to the regulations, combating drugs or the history of karting. The three Drivers who correctly answer all the questions in the fastest time are awarded podium positions (and cash prizes) on Sunday. For the U18 World Championship, these are the Italian Armando Iannaccone, Bahrain’s Ali Mohammed Al-Khalifa and the Briton Sam Webster. As for the younger competitors for the CIK-FIA Academy Trophy, the top scorers were Thomas Michael Bale, representing the United Arab Emirates, the Italian Enrico Pillon and the Russian Alexander Maslennikov. In the afternoon, Non-Qualifying Practice confirmed what observers had expected: the contest will be extremely open in the U18 category, in which the Finn Ville Mäntylä (Energy) and the Briton Henry Easthope (Sodi) were fastest. But the Frenchman Anthoine Hubert (FK), the Briton Matthew Graham (Zanardi), the Monegasque Charles Leclerc (ART GP) and the Frenchman Jules Gounon (Sodi), to mention just a few, confirmed that they will also be in the reckoning. For the Academy Trophy, the Briton George Russell has already established himself as the man to beat, but the young Finn Joonas Lappalainen also showed his pace. In reality, many Drivers can dream of leading positions, from Qualifying Practice on Saturday morning … so there will be no lack of suspense for the opening competitions before the Championship moves on France (Angerville, 24-26 August) and Bahrain (Sakhir, 8-10 November).